3 Communiqués is a documentary fiction charting a journey through the marginal histories of communalism, self-presentation and collective agency. The narrative speculates as to the significance of a small pamphlet, a strange orange flower, the disappearance of a statue and the productive misreading of theory, while succumbing to the vertiginous unreliability of archives. Contributors: JJ Charlesworth, Melissa Gronlund, Pablo Lafuente, Lisa Le Feuvre, Paul O’Neill and Mick Wilson, Sarah Pierce and Emily Pethick. ‘Apart from a short communiqué we remained silent… why? who is the Angry Brigade… what are its political objectives… a lot of criticism was directed toward vague directions… we believe the time has come for an honest dialogue… through the Underground Press… through anything. Look around you brother and sister… look at the barriers… don't breathe… don't love, don't strike, don't make trouble… DON'T… Slowly we start to understand the BIG CON. 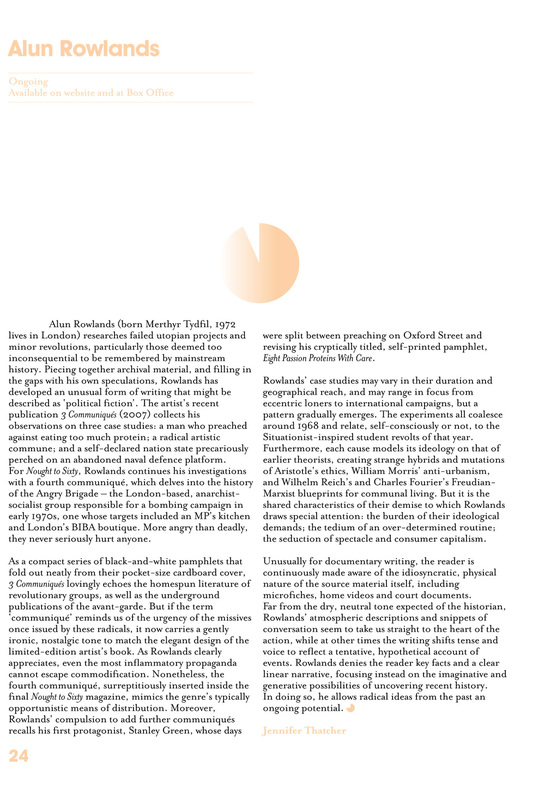 'The fourth communiqué, surreptitiously inserted inside the final Nought to Sixty magazine, mimics the genre's typically opportunistic means of distribution. Moreover, Rowlands' compulsion to add further communiqués recalls his first protagonist, Stanley Green, whose days were split between preaching on Oxford Street and revising his cryptically titled, self-printed pamphlet, Eight Passion Proteins With Care. Rowlands' case studies may vary in their duration and geographical reach, and may range in focus from eccentric loners to international campaigns, but a pattern gradually emerges. The experiments all coalesce around 1968 and relate, self-consciously or not, to the Situationist-inspired student revolts of that year. Furthermore, each cause models its ideology on that of earlier theorists, creating strange hybrids and mutations of Aristotle's ethics, William Morris' anti-urbanism, and Wilhelm Reich's and Charles Fourier's Freudian- Marxist blueprints for communal living. But it is the shared characteristics of their demise to which Rowlands draws special attention: the burden of their ideological demands; the tedium of an over-determined routine; the seduction of spectacle and consumer capitalism. Communiqué § 4 is a political fiction drifting in and out of material archives. Speculating about communitarian politics, action and writing it descends into the underground to meet the angry. Following 3 Communiqués this pamphlet continues the renegotiation of unfulfilled beginnings or incomplete projects – in art and politics alike – that might offer points of departure again.